Posted July 22nd, 2016 by Suwannee River Rendezvous & filed under River Lore, Suwannee River Activities. More than a hundred years ago, the serene site of Convict Spring looked mighty different, and not just because there were no cars, no planes overhead, no cellphones and certainly no TVs. Instead, right here at the Suwannee River Rendezvous, if you were taking in the sights, there’s a very high probability you were working on a chain gang. Back in the early 1900s, our spring was used by Lafayette County’s incarceration system, notes Florida Caves. Their prisoners worked on road construction projects – often called chain gangs – and when it was too late or too far to get the inmates back to the county jail, they would spend the night at remote camps scattered throughout the county, and Convict Springs was one of those remote camps. It’s hard to imagine grizzled criminals gathered around campfires, the light reflecting in the spring, but history doesn’t lie. Every once in a while, someone will turn up an artifact of one kind or another that further confirms the property’s colorful past. Convict Spring sits atop a fascinating underwater cave system as well, one we’re certain the convicts didn’t spend any time exploring. This particular cave system is a dangerous one, with a restricted entrance and the need for a side-mounted style of diving through extremely narrow passages, notes Cave Survey in its assessment of the spring. In 2001, Dell Moats, John Moseley, Michael Poucher and Bill Rennaker swam through Convict Spring Cave to take a full survey. They captured extraordinary video footage showing the beautiful yet dangerous conditions inside the cave. 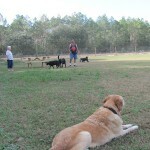 We have DVD footage of their excursion, and in the lodge. 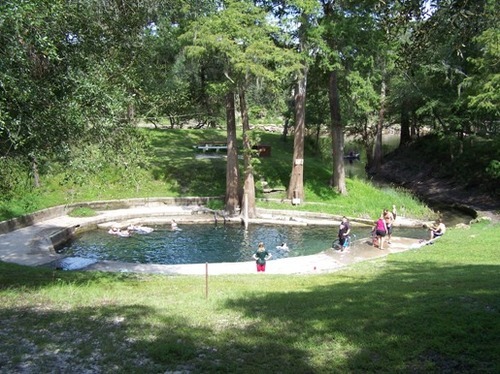 We invite you to come enjoy the spring – from the surface, of course – for swimming during the sultry summertime at Suwannee River Rendezvous. In the evening, over the sound of crickets and frogs, you might just hear the faint rhythm of a chain gang. 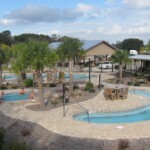 Convict Spring is just one of the many amenities and conveniences that makes our resort and campground such a popular destination for visitors from all across the country. To plan your trip, call us today at 386-294-2510. Posted August 11th, 2015 by Suwannee River Rendezvous & filed under River Lore. It’s depressing to think that the summer is almost over. We’re already in the first week of August! Before long, the crisp winds of autumn will be sweeping over your body like a marching band of multi-colored spiders. Your body will tingle, but your heart will know that any opportunity to extract the resources of summer have long passed you by – and that’s always a blow to the soul. Not something that will propel you into winter. Even writing (or reading) that word gives us headaches. Thankfully, Suwannee River Rendezvous is located in Florida, which means that we get to avoid the avalanches of cold so many of you have to struggle with. But statistics show that winter is expected to come early and more furious than in years past. You might as well enjoy the rest of the summer when you have the chance, and that includes hopping in your RV and seeing the country – it’s what all the baby boomers and adventuresome seniors are doing, which are behind the biggest resurgence in RV sales since the early 1990s. Jackie Crosby of Fredericksburg.com writes, “The skyrocketing sales are fueled by the 10,000 or so baby boomers who are turning 65 every day, plus a large band of 50-somethings who are planning for an active or early retirement.” Basically, these people are determined to experience the romance and grandeur of America, but have no interest in camping. We can’t blame them, as camping isn’t for everyone – but since we encourage the outdoors by any means necessary, RV-ing it up is the only option for some people! Jeff Nobbe, general manager at Shorewood RV Center in Anoka, Minnesota sums it up best: “People are retiring and living more for today than the future. They weren’t doing that before. They were buying lake places before.” This is most certainly an exciting trend to see! Experience America this summer! You don’t have much time left! Posted July 1st, 2015 by Suwannee River Rendezvous & filed under River Lore. There are different kinds of campers. Likewise, there are all different kinds of camping trips. There are of course the traditional, weekend camper you could find at any state park across the country on any given Saturday and Sunday. But then there are the more adventurous campers. We are all familiar with the ‘family camping’ trip. The first component to family camping trip is what’s known as the contemporary nuclear family, with a mother, father and 2.5 children. Those enjoying the family camping trip, known as ‘family campers,” usually pull their SUV right up to the campsite where they plan to spend the long weekend. 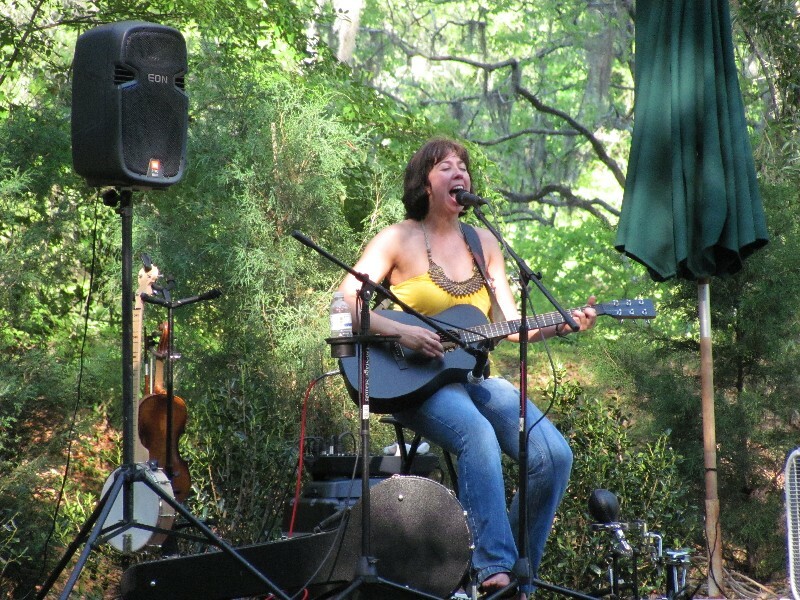 What is usually most fundamental to the family camping trip is the type of campground selected. Family campground sites facilitate the park and camp principle, allowing family campers to park as close as possible to the site. This is because your typical family camper will pack everything that can possibly fit in their vehicle to contribute to their comfort on their camping trip. This can include anything and everything from 6 collapsible chairs to a full size grill to an 8-man tent. Then there is the kind of camper who likes to travel lighter and quicker. They may also want to take a bit more adventurous of a route, either off the beaten path or away from the pollution and noise of vehicular traffic. These campers, ‘light and fast’ or ‘woodsman campers,’ integrate hiking as the main component to their camping trip. Enjoying only the comforts which can fit in a backpack, the ‘woodsman camper’ packs a bit more conservatively than the ‘family camper’ counterpart. Because everything you camp with you must hike with, and a hiking bag only holds so much, scaling back what to bring as a woodsman camper is crucial. This means trading in a grill for a pocket camp stove, the 8-man tent for a bivvy bag and a giving up your collapsible chair. You may also want to trade in that 18 pack of beer bottles for a flask of whiskey. Posted June 4th, 2015 by Suwannee River Rendezvous & filed under River Lore. The sport of kayaking has become very popular these days, and more and more people are jumping into the water, paddles in hand ready to take on their next adventure. There are lots of things to take into consider when choosing a kayak, however. First and foremost, you need to think about what type of kayaking you’ll be doing. Will you be whitewater kayaking, sea kayaking, kayak touring, sit-on-top kayaking, surf kayaking or just recreationally kayaking? This is important to know because one can’t go out and buy a sea kayak and expect to whitewater kayak in it so you have to make sure you’re choosing a kayak for the right reason. The next question you should consider is what should the kayak be made out of? A lot of times beginners will want to purchase the best boat they can get their hands on, however you should really consider starting out slow and continually upgrading down the road. For this reason it is probably best for you to purchase a plastic kayak to start and the reasons for this are they are durable, less expensive and heavier than the composite ones. In correlation to the make of the kayak, you’ll also want to evaluate what size you need to buy as well. While there are many different kayaks, the size generally refers to the volume, length, width and weight of the kayak. 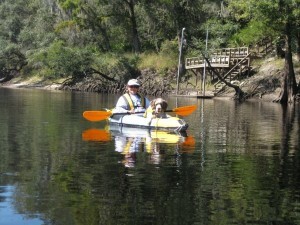 Pay very close attention to the weight range of the kayak as well as the comfortability of it. You do not want to be sinking in the water while kayaking downstream, or feel crammed inside of the boat either. Finally, decide if you want any other types of kayak accessories to come with your boat. You can purchase kayaks with different riggings, types of hatches, backrests or storage compartments. Find and analyze all the options in this department and choose the one that best suits your style. 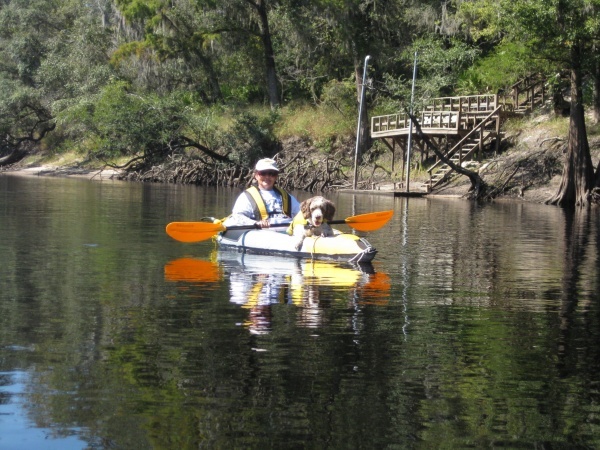 Posted June 1st, 2015 by Suwannee River Rendezvous & filed under River Lore. 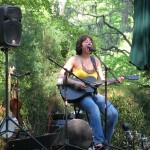 The best part of going camping is the amount of activities that are available in conjunction with your trip. Family members of all ages can find something fun to do in the great outdoors during your upcoming week or weekend camping trip. 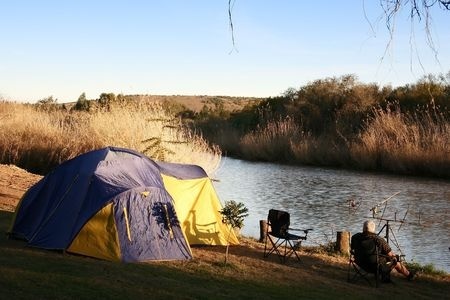 Setting up camp by a river or lake provides a scenic view as well as short trip to the banks for some quality fishing time. 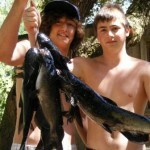 Adults and children alike can enjoy the thrill of fishing together. Veteran fishers are able to spend the day luring in native fish while smaller children can fish on and off throughout a hot summer day. Caught fish can also be used to make a fresh dinner over the open fire. If you and your friends or family prefers a more active way to spend a day of camping, there is plenty to see on a hike. Pack a bag with snacks, water and sunscreen before you head out. Hiking in the mountains or along the riverbanks gives hikers the opportunity to exercise as well as see elements of nature that may be completely new. This is a great exploratory activity for children of all ages as well as adults that want to immerse themselves in nature. Maybe you want to spend some time out on the water instead of sitting or walking. 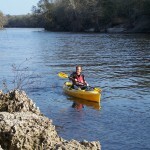 Kayaking is a great activity that can be done at your own pace without a huge time commitment. Renting kayaks for a day or week gives you the chance to paddle around a river or lake to sightsee, sunbathe or just explore. Single or double kayaks can be found depending on your group size and their ages. The great thing about kayaking is that everyone can participate, even small children when they share a kayak with an older adult. At the end of a busy day fishing, hiking or doing another fun camping activity there is a great thing to do before you go to bed. Having a campfire cookout is an opportunity for everyone to share the stories of their day including what they saw and what they liked doing. From hot dogs and hamburgers to fresh-caught fish, campfire dinners are always fun and filling. Eating dinner around the fire is a great time for family and friends to bond before settling in for a good night’s rest and another day experiencing the outdoors. Posted May 1st, 2013 by Suwannee River Rendezvous & filed under River Lore. 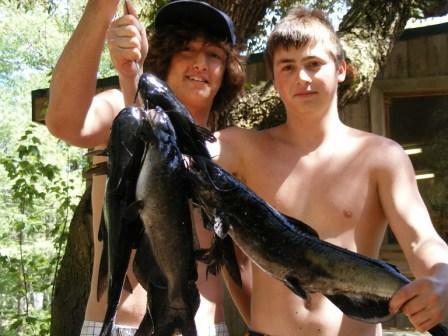 One of the most popular activities our guests like to take part in is the amazing fishing on the Suwannee River. What’s so great about this sport is that folks of all ages can enjoy it! Whether you’re a beginner who’s just looking to have a little fun on the water, or an avid fisherman in search of some excitement, you’re bound to find what you’re looking for on the river! Make sure you have the Right Equipment –There are plenty of great brands that carry rods and reels that are specially-made to help make things easier for someone who is just beginning. Check them out at your local sporting goods store and see if anything peeks your interest. Choose the Right Bait – Your basic worm on a hook can go a long way for a relaxed day on the water, but consider doing some research on which type of bait attracts the particular fish you’re looking to catch. Just like you’re attracted to different types of food, fish are attracted to different kinds of bait. Check the Weather – You may be praying for sunny skies but sometimes, it’s the overcast that leads to a great fishing day. Dress Appropriately – Boots are your new best friends. Make a note of it. Bring Food – It could be a while before you catch anything on your first day. Be sure to pack a snack! 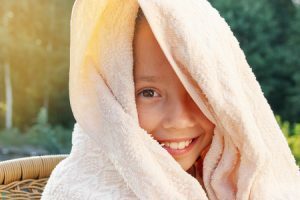 Bug Spray – Need we really say more? 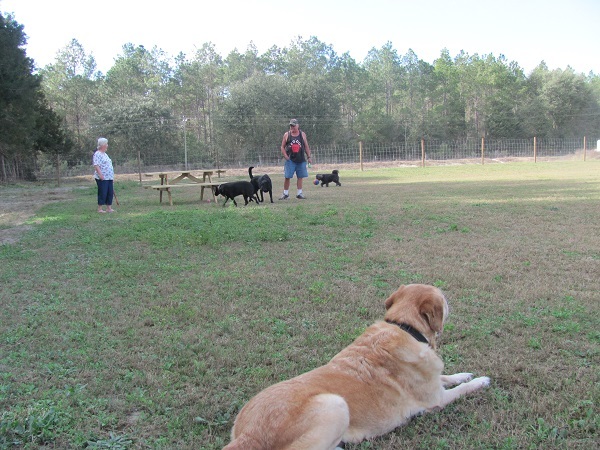 Once you’re ready to take on some serious fishing fun, be sure to give Suwannee River Rendezvous Resort & Campground a call! We’d love the opportunity to watch you hone your skills as you make your way to pro fisherman status! Posted April 24th, 2013 by Suwannee River Rendezvous & filed under River Lore. 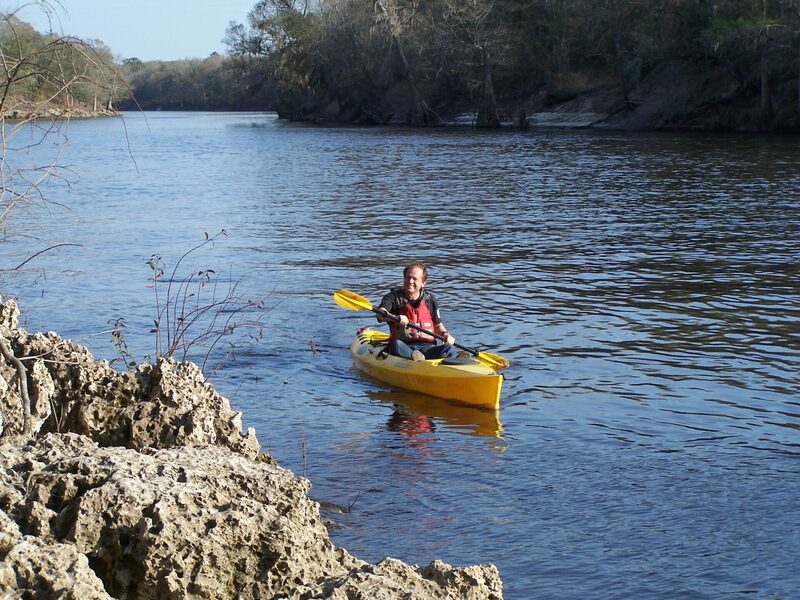 Here on the Suwannee River, we have found that the most popular recreational activities for our guests are both canoeing and kayaking. We see a number of folks coming in for rentals each day, as they prepare to get out onto the water. However, with these boats being so similar, we are often asked one important question: What’s the difference between canoeing and kayaking? 3. The seat height on a kayak is much lower, with the occupant positioned on the ground, feet stretched out. If you’re looking to take a leisurely trip out on the water with a few friends or family members, a canoe is going to be your best choice. Canoes are built a bit sturdier and are able to carry more weight, which means more room for you, your loved ones and maybe even a picnic basket. Kayaks are going to be a better bet for those who are looking to race or get a good workout in. The sleek design of a kayak allows them to move much faster than a canoe, which makes them perfect for competitive sports and slipping through whitewater rapids. Regardless of whether you choose to go with a kayak or canoe, at the end of the day it’s all going to lead to one thing: a whole lot of fun! 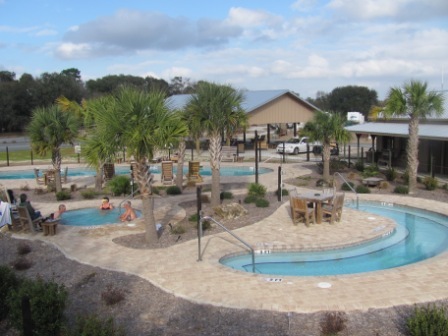 So stop in our rental facility at Suwannee River Rendezvous Resort & Campgrounds and get out on the water! 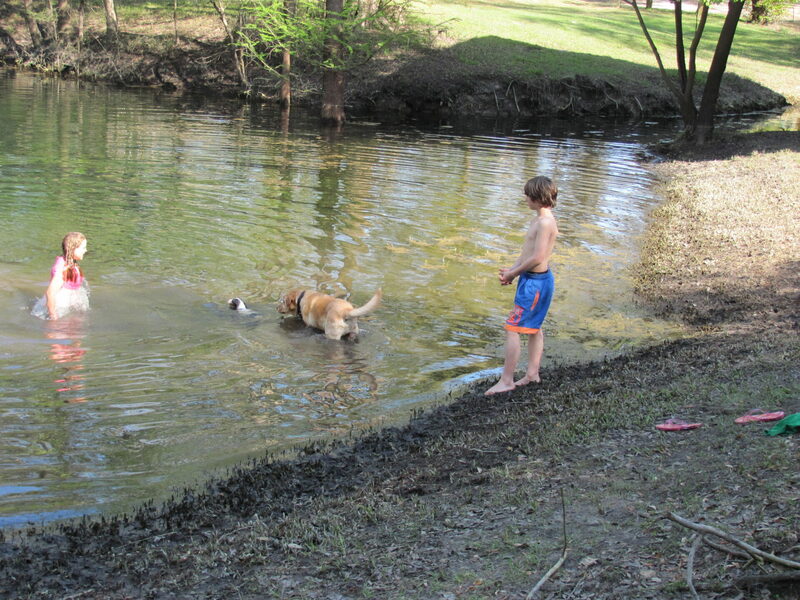 Posted April 6th, 2013 by Suwannee River Rendezvous & filed under River Lore. We are pretty much back to normal. The river has gone down quite a bit and we have moved back into all the buildings with no damage to anything. 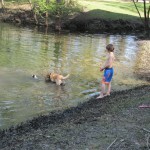 The springs are starting to clear up. We had a great turn out for the annual Easter Egg hunt. Lots of helpers, and lots of hunters.